Job 28:23-28 - "For He (God) looks to the ends of the earth and sees everything under the heavens. "When He imparted *weight to the wind and meted out the wa ters by measure, when He set a limit for the rain and a course for the thunderbolt, then He saw it and declared it; He established it and also searched it out." 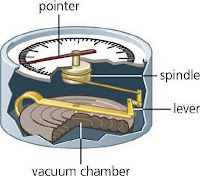 *Some people have attempted to say that this verse has nothing to do with air pressure. After examining this verse I've found that the reference to the "weight to the wind" can also be translated “how hard the winds should blow.” In view of this it is all the more amazing since the wind velocity, as we well know today is determined by barometric pressures, which is exactly what is indicated in the verse above. So whichever way you want to look at this verse, you can't escape the fact that it does have everything to do with air pressure. The air flows from high pressure to low pressure producing wind. Job 36:27-29 - "For He draws up the drops of water, they distill rain from the mist, Which the clouds pour down, they drip upon man abundantly. Can anyone understand the spreading of the clouds, the thundering of His pavilion? "Psalm 135:7 - He causes the vapors to ascend from the ends of the earth; Who makes lightnings for the rain, who brings forth the wind from His treasuries. Ecclesiastes 1:6"Blowing toward the south, then turning toward the north, the wind continues swirling along; And on its circular courses the wind returns." The slow rotation of the earth toward the east causes the air to be deflected toward the right in the northern hemisphere and toward the left in the southern hemisphere. 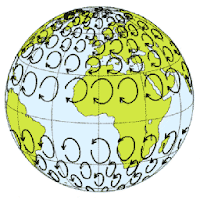 This deflection of the wind by the earth's rotation is known as the Coriolis effect. Air pressure, air currents, lightning strkes and the water cycle - all revealed by God in the Bible over 2600 years ago! Now Jewish tradition attributes the book Job to Moses. It certainly is a Hebrew writing and predates Christianity by at least 600 years and the discovery of atmospheric pressure by over 2,000 years!